I am trying to create a Firebird UDF using CT. As Firebird UDF require ib_util_malloc if you use String and I did that. But can't link the libib_util.so. I compile it for 32bit Linux using CT Typhon 32 on Fedora 28. 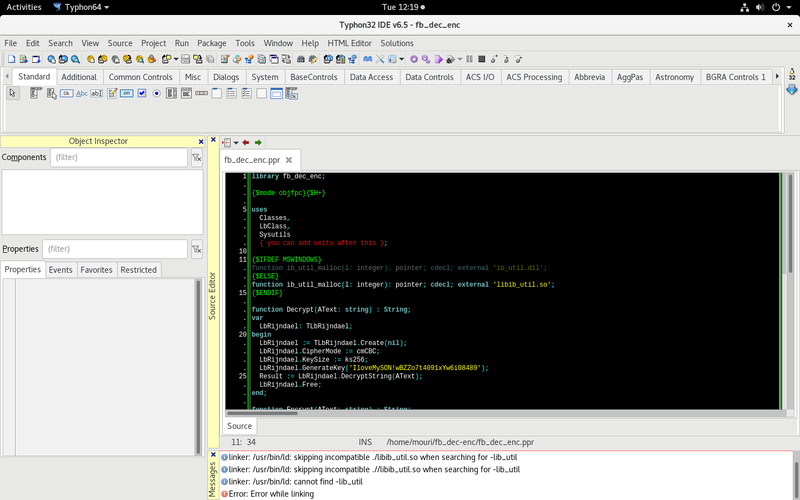 As I am developing UDF for Firebird 1.5 which is 32bit that's why I am using Typhon 32. I copied libib_util.so on my project folder but still, it can't link libib_util.so. How to link it please help? Please see the attached screenshot. Where should I put the 32bit libib_util.so? In app folder or usr/lib folder? Last edit: 1 month 9 hours ago by Sternas Stefanos.